Forever gone is the boring 3-in-a-row game of tic-tac-toe. 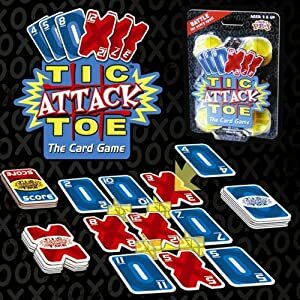 Enter Tic-Attack-Toe, the all-new, fast-paced answer to the original version. You’ll never think of tic-tac-toe in the same way again. -PB & J Toy Co. I received a Tic-Attack-Toe Game to try out. WOW! My kids love it. What a creative twist to tic tac toe. Only with this version, the winner is declared when a player gets 3 in a row, then that player gets a scorecard and when you get 5 score cards in a row you win. The playing board also doubles as the carrying case. THIS GIVEAWAY IS NOW CLOSED – WINNER #47 VIVA – I SENT YOU AN EMAIL! Thank You PB & J Toy Co. for this great giveaway! This giveaway is open to US Residents until 9:00 pm Eastern on 9/28/2010. The winner will be chosen using the random.org generator. The winner will have 48 hours to respond to my email before a new winner is selected. Good luck and don’t forget to leave your email if it is not on your profile. I will contact the winner via email. The only other product that I can pull up on their website are the Sports Cars….my son would enjoy these..
My children would also love the Living Color Aquarium. The sports cars or the musical chair game would be great on a rainy/snowy day. I couldn’t view any products but the sports cars, but the Musical Chairs game sounds fun. I like PB&J toys on FB. I am the master at card games. Mostly uno though. I would like the Musical chairs cardgame! I like the Musical Chairs game the best. oh I’d also love the musical chairs card game! like PB & J on Facebook, and left the comment! I love all the sports cars toys especially Dennis “The DJ” Jones. I LOVE the tree one!! so wonderful!! Maybe it was just me, but had trouble seeing other products. The Living Color Aquarium seems interesting, but it just gave me booth number for the fair. Thanks! The living color aquarium looks like something my son would like. What a great stocking stuffer! I also like the idea of the living color aquarium, hope to see more info about it soon! I’m a blogfrog member of yours! The living color aquarium sounds great. Thanks! I like the Sports Cars. I would also like to try the musical chairs card game. hmmm…If there were actual product info for the other products, I might know which ones I want.